If you're anything like me, you're often taken aback or just mildly embarrassed by the covers on some of your favorite books. Whether it's a riproaringly awesome urban fantasy novel dragged down by a strangely Harlequinn Romance-style cover or a great piece of fantasy that suffers from a poorly designed dust jacket, you can feel a little weird reading it out in the open. 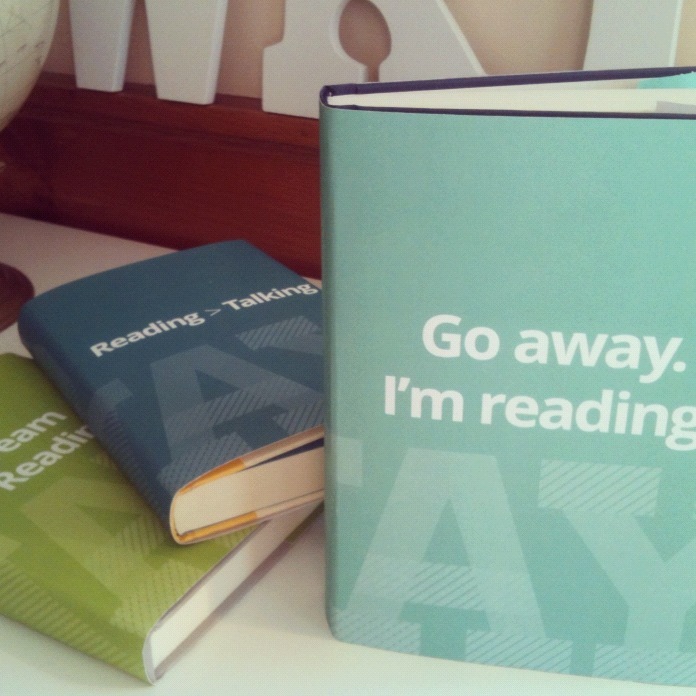 Or perhaps you're tired of people trying to bother you as you're reading. Thankfully, there is a stylish and awesome solution. Erin Bowman and her very talented friends, Tracey Neithercott and Sara Henni, have created beautiful and FREE printable book covers for you to create and enjoy. They're nothing short of genius. They're all sized for a YA hardcover, but they're working on making mass market, trade and e-reader sized ones. With slogans ranging from "Go away. I'm reading." to "In Forks. Send help! ", they're hilarious, fun and sure to make a point. They're also all gorgeously designed. There are eleven covers in all, and each one is ridiculously awesome. Erin Bowman's website involves all the instructions you need to get them printed and assembled. All for the shocking and amazing price of free. I know what I'm attempting to make this weekend! its a really great idea to for printable book covers. i will do it for my books.